Major Goals for adventure/module/campaign writing. Many times an adventure is written up and its largely the action areas where the crux of the adventure takes place. A good term for this is the "tactical environment" where action and tactics takes place. The word tactics immediately suggests that it's action and combat oriented but not neccessarily, role play may take place here as well. The point is that this is the central location of the adventure where the action is intended to be centered. If I compared it to a classic Basic D&D gaming module like B2 Keep on the Borderlands (also known informally as the Caves of Chaos) this would be the actual caves area. 2. Players need a place to spend their coin- armor upgrades new equipment etc., repair broken equipment etc. 4. it offers a place to begin new adventures, plot hooks, jobs, contracts etc. 5. it offers a place to access information about loot, the setting, antagonistic NPCs, find clues to unravelling the current adventure etc. Also in B2 Keep on the Borderlands the region around the keep was given a cursory map with some details like a bandit camp and lizardman mound. This environment can stradle the line between strategic and tactical- its often a place for tactical encounters but does not have to be. The bandits can be overcome with negotiation and be turned into a strategic location for rest and recovery with a quid pro quo of the players fencing some of their ill gotten gains in the keep for them. By providing a bit of regional environment B2 allowed the players an option for more sand box style of play and not rail roading them directly to the caves. This creates options for referee and the players. In B2 it didn't take much to provide this other than a map and a few keyed locations. Ther referee was free to develop this thin material more at need. NPC contacts are important as well. In B2 this was provided in embrionic fashion with a listing of stats for major NPCs like the priest. Clearly the go to NPC to ask questions about an evil artifact or cursed item at the keep was the priest. Having a couple or more go to NPCs for the players to interact with is always good as these characters can offer adventure hooks, information, clues, or offer a little be of help in their areas of expertise like healing or removing of curses. Finally, a good goal of an adventure/ campaign could or perhaps should be to deepen the ties between the PCs and the setting. Gaining membership in a society within the setting as a adventure reward is good- if offers benefits but also carries some responsibilities. Developing relationships with key NPCs does this as well. (note developing key NPCs as contact is first required) If the players have asked named NPCs for help then those same NPCs could ask them for help. Non monetary rewards also help in this connection to the setting like gaining a conveyance (star ship), docking slip, title, fame etc. 3. regional environment- for some flexibility in case the players go off script. There has been some great development in the Star Frontiers setting concerning mega corp, the Frontier economy, and touching on matters involving space stations and star ships at the Star Frontiers community development site. In depth analysis of the various mega corps can be found, as well as history discussion concerning the dramatic changes that Pan Galactic Corporation under went as a result of the corporate war fought on Laco. A new PGC company logo from pre Laco War is in development as well. Look for some fascinating things to come out of this project. If you are someone who likes to have physical copies of the magazine, the print edition of isse 2 is now available. We had hoped to have it available at the same time as the PDF version but keep running into delays in getting the print media ready to go. But it is available now and looks great. If you want to grab a copy, jump on over to the Issue 2 product page on DriveThruRPG to order one. This is probably more a twist for a fantasy adventure but could work for science fiction. The party of player characters are searching for the Tomb of Dude Rex and think they find it but it turns out to be his cenotaph. A cenotaph is an empty grave created to memorialize the dead individual and his real tomb is elsewhere. In the Old Kingdom Egypt the first dynasty rulers had a tomb and a cenotaph both; one in Upper or southern Egypt and one in Lower or Northern Egypt. This occured because the 1st dynasty rulers were the ones that unified Upper and Lower Egypt thus the ruler was represented in death in both lands. The modern controversy is which is the tomb and which is the cenotaph. Its a twitst from the real world and cetainly one that I dont remember ever encountering in an RPG. Another twist- the true treasure is hidden in the cenotaph but cannot be uncovered without clues from the tomb- as the dead king was worried about grave robbers. Perhaps the dead king rises as a liche and forgoes killing the player characters that disturbed his slumber being anxious about his hidden treasure back at his cenotaph. Issue 2 of the Frontier Explorer magazine is now available. This issue is once again filled with system briefs, new ships, locations, creatures, and background material for use by GM's in their games. This issue also includes several contributions from community members, a milestone we hadn't expected to reach for a couple more issues. Needless to say we're excited. Continuing with the 30th Anniversary of Star Frontiers theme, this issue delves into the archives and contains a summary of some Star Frontiers gaming conventions held back in 1999 that included interviews with some of the game's original developers. These interviews provide insight to some of the philosophies that went into the design of the game. We also have the next installment of the Mooks Without Numbers adventure and introduce a new series by explorer Jurak Hangna that will present a new alien creature in each article. Grab your copy and keep exploring new frontiers. 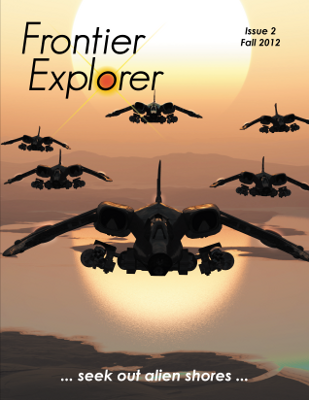 I'm pleased to announce that the print version of issue 1 of the Frontier Explorer is now available. As this was our first attempt at this, it took us a little longer than we would have liked to work through the process. For future issues the print edition will be available closer to, if not at the same time as, the public release of the electronic version. (Remeber that by registering here at the magazine's website, you will get a sneak peak preview a week or two in advance of the public release). The print edition is full color throughout, just like the PDF, and is bound saddle stitched (staple in the middle) so that it will lay open and flat on the table if you so desire. The town map from the Mooks Without Number adventures (pages 22-23) was positioned to be on the center pages of the print edition and is printed as a single complete map. As such it can be easily removed and placed on your gaming table for use while running the adventure or anywhere else you'd like to use it in your campaign. Our print editions will be available through the DriveThruRPG site (where you can also download the electronic version as well). If you're interested in having a physical copy, jump on over to the issue 1 product page and order one. The website will be down for a few hours of maintenance starting at 10am MDT on Friday, Aug 24th. We're getting a network upgrade that will more than triple the download speed of the website allowing you to download the magazine issues and hi-res images faster (and support more people doing it at the same time). UPDATE - 08/23/12 10:00 pm MDT - The upgrade has been postponed until a future time due to some medical issues I have to take care of in my family. I'll post another update when the new upgrade time is scheduled. UDPATE - 08/24/12 3:15 pm MDT - The upgrade is done. They showed up unexpectedly this afternoon while I was home and we did the switch over. You should enjoy faster downloads now. This series was concieved and started a year ago to add challenges that were not combat related to the referee's toolbox. Combat is invariably one of the primary challenges in most rpgs and this is not likely to change. However, throwing a non combat challenge at the PCs can spice up an adventure and add some variety. Each article is focused on a particular theme: water, heat, lunar dust and more to come. Some hazards are environmental factors and others weather effects. Issue 2's article is written and this Fall the new challenges will involve the toxicity of lunar dust. Due to a technical issue the Hi-Res download links for maps and images weren't working. That has been fixed and nearly all the images and maps from issue 1 are no on-line and available for download. Remeber that these images are copyrighted by their owners. You may use them for personal use only unless otherwise stated by the artist/creator.